Brown rot, caused by Monilinia fructicola (G. Wint.) Honey, is a destructive disease of stone fruits (Prunus spp.). The disease expresses as blossom blight and fruit rot. 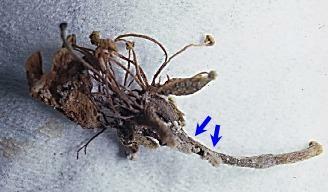 In spring, ascospores or conidia produced from mummies infected by M. fructicola serve as inoculum sources that cause blossom blight under favorable microclimatic conditions. 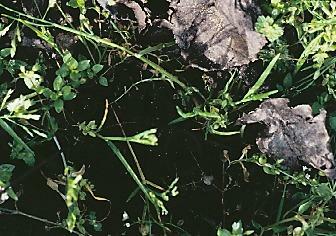 Blossom blight may cause severe yield losses on stone fruit by reducing the number of flowers. Blooming season of stone fruits in California may last for about 2 months, starting in mid February for peach and ending in mid April for prune. Although pandemics of brown rot blossom blight occurs infrequently in California, disease of various severity levels often occurs in different host species and at different locations. Inoculum potential and weather conditions in orchards during bloom can significantly influence disease development. In orchards with a history of severe brown rot and high inoculum potential associated with disease favorable microclimatic conditions, chemical control at green tip stage has been routinely applied. However, most of the orchards have low levels of inoculum potential and are subjected to changing weather conditions during bloom. Growers have difficulty in making decisions on whether or when chemical control is necessary. Precise estimation of the risk for blossom blight development can effectively reduce cost of disease control. Our previous study demonstrated that temperature and wetness duration are important environmental factors affecting the development of blossom blight. The optimal temperature range for infection of blossoms by M. fructicola is between 20 and 25ºC. Longer periods of wetness duration could bring about more severe infection of fruit than shorter periods of wetness duration. 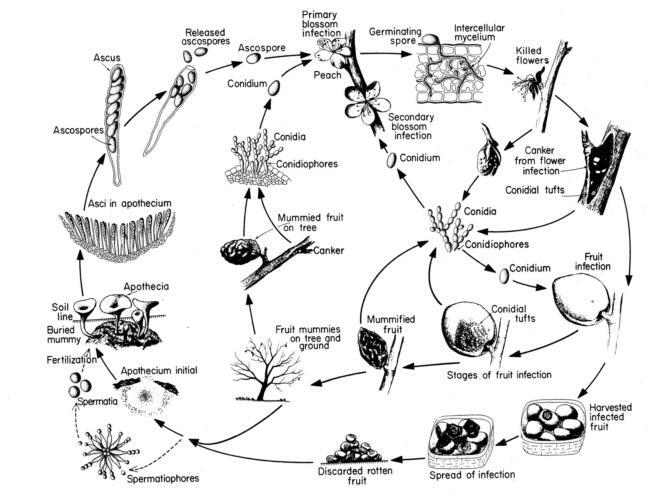 Severity of infection of fruit increased along with increased inoculum concentration. We provided a risk assessment system to help growers in decision making for fungicide application to control blossom blight. Infected blossoms with sporulation may also serve as sources of conidial inoculum for infection of fruit. The infected blossoms that may not express as blossom blight could become the young fruit with latent infection. 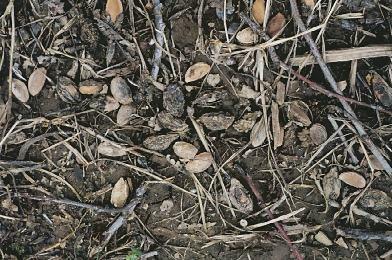 Non-abscised, aborted fruit in trees and thinned fruit on the orchard floor are important sources of secondary inoculum for fruit brown rot. Our previous studies demonstrated that inoculum potential in orchards, microclimatic conditions such as wetness duration and temperature, and fruit resistance at different fruit developmental stages all were important factors affecting latent infection. The optimal temperature for latent infection ranged from 23 – 25°C, and wetness duration over 12 hours could lead to high infection level than shorter wetness duration. This study had determined the seasonal patterns of bloom and fruit susceptibility to latent infection by M. fructicola. The susceptibility to latent infection at bloom stage was at a moderate level, increased to reach to the highest level at about pit hardening stage, subsequently, decreased, reaching the lowest level in early June at embryo growth, and increased again along with fruit development and maturity until harvest. We also determined that spore density in the air increased from March to April and decreased to a low level in May. However, the dynamics of inoculum potential in orchards could be influenced by cultural practices such as fruit thinning and irrigation during the growing season. Chemical control is still an important disease management strategy. However, effective fungicide sprays should be scheduled and performed based on consideration of inoculum potentials, future weather conditions, fruit susceptibility to infection and orchard cultural practices. Effective fungicide application to control blossom blight is critical in disease management early in the season. Proper timings of fruit thinning and irrigation are also important especially in mid- and late-season to reduce risk of latent infection. Therefore, a decision support system will be useful to help growers in decision making to control disease.  This special website contains an important system named “Decision Support System for IPM of Prune Brown Rot”. The decision support to control blossom blight has been finished, while other parts of this system are still in construction. 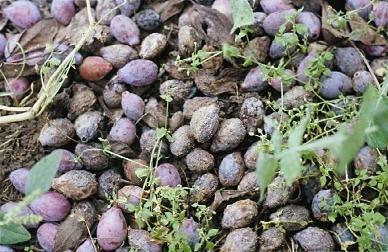 The brown rot of prunes is emphasized , but principles could be applied to other stone fruits. This system could also be extended to brown rot of other stone fruits. 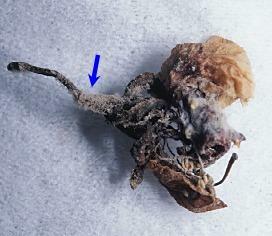 Apothecia produced from infected mummies could serve as sources of primary infection of blossom causing blossom blight. Infected mummies left on the orchard floor could also produce conidia which may cause infections of blossoms and young fruit. Infected mummies left on trees can also produce conidia which may serve as sources of primary infection of blossoms and secondary infection of young fruit. 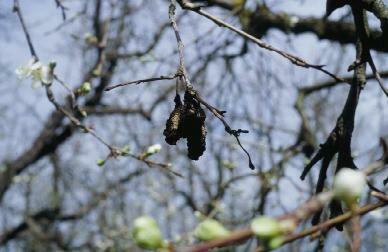 The typical symptoms of blossom blight. Spores are produced on stem and petal of flowers (indicated by arrows). After fruit thinning, latently infected fruit dropped on the orchard floor could become sporulating fruit. These fruit can also infect the attached non-infected fruit. 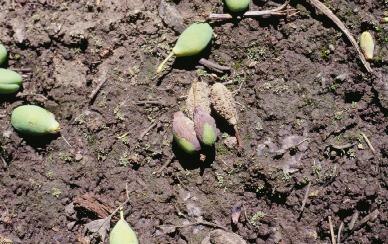 Inoculum in the orchard could be accumulated and lead to severe secondary fruit infection. 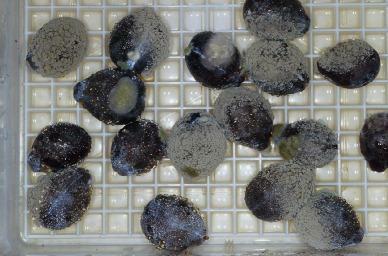 The overnight freezing incubation technique (ONFIT) could be used to investigate the levels of latent infection in the mid- and late-season. 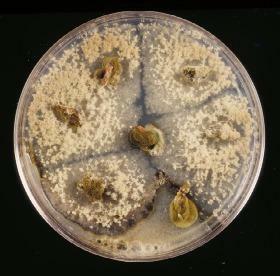 Latent infection level on mature fruit can also be determined by culturing fruit tissues on the lactic acid amended medium.